A quaint little mall along the side of the bypass on the OBX. It doesn't look like a typical strip mall. It looks like a bunch of beach houses strung together in a square. 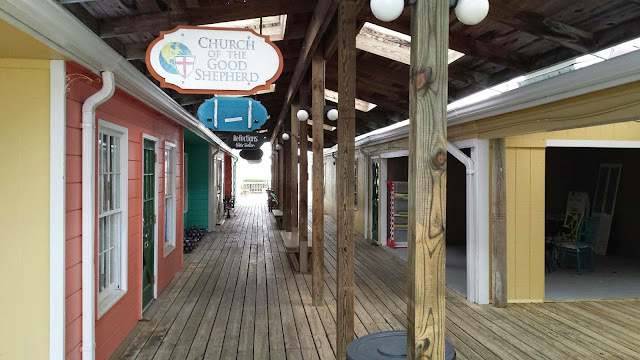 The houses are painted different pastel colors, and there is a boardwalk going around the inside of the square, a covered walkway to view the shops without getting wet. A couple of the shops are antique stores, which fits the quaintness of the locale. There's a shop that sells traditional acoustic musical instruments. 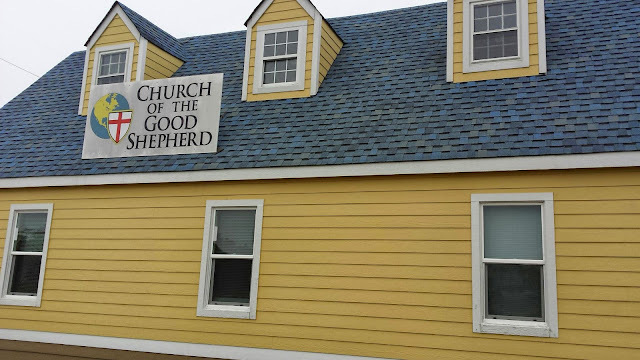 There's one of the OBX newspaper offices. Overall, it feels like traveling to another time, an older time. In the southwest corner of the houses of Central Square: a small church. Just before entering, a sound: a flute playing, warming up with melodies from a hymnal published in 1940. Familiar tunes: Holy, Holy, Holy. Come Thou Almighty King. No projector. No rock band. No light show. No choir. 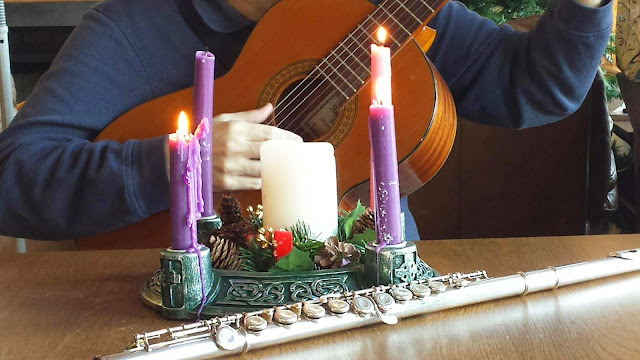 Only the flute, the guitar--the pastor plays guitar--and the voices of the people of God. 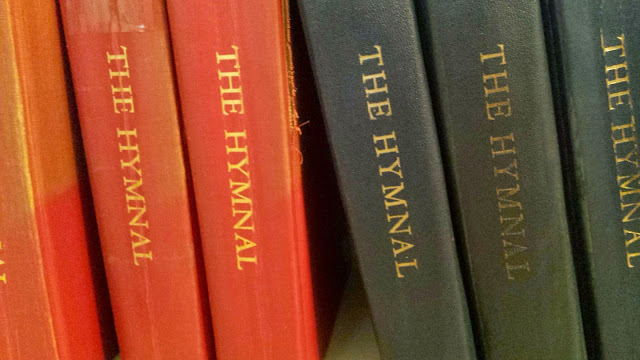 Take an actual hymnal, a book, with pages. Also, take a Book of Common Prayer, the approved text for the Anglican Church in North America. Finally, take a leaflet that has scripture readings on it. 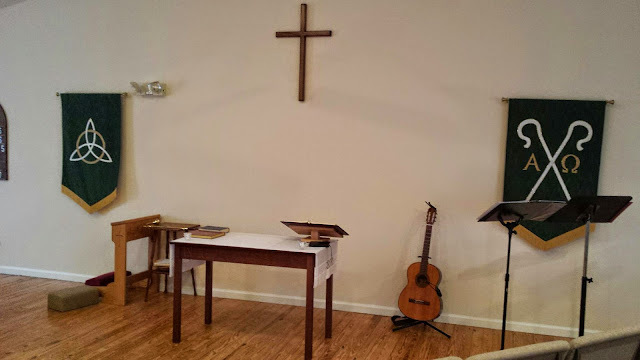 Each week, there's an old testament reading, an epistle reading, and a psalm sung. The Psalter is not recited here, but sung. The songs in God's songbook, penned by David and others, are sung aloud to melodies. Finally, words from the Gospels of our Lord; from Matthew, Mark, Luke, and John; are read by the pastor from the center of the room, all the people standing in reverence. The sermon is Biblical. The pastor preaches about sin. He preaches the law. We are convicted. We are brought low with the realization that by God's holy standard, we deserve death and hell. We are also lifted up with the realization that God himself paid the penalty for our sins, and we have been redeemed. We are God's own, and nothing can undo that. We are brought to joy. The Pastor tells of the Puritans, like Owen and Bunyan, who have thought through the Bible long ago and have passed down their wisdom to us. 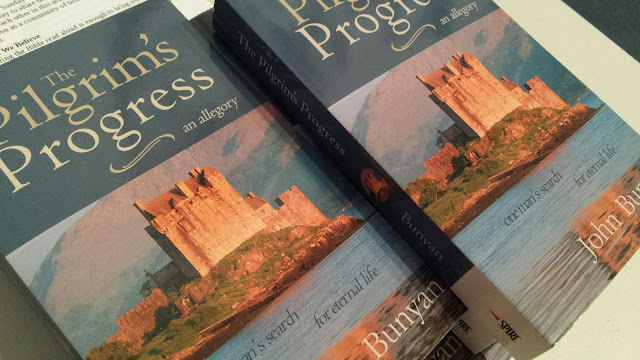 We are even encouraged to take The Pilgrim's Progress home with us as a free gift. The allegory of the journey of Christian and Christiana changes our hearts and our lives. Prayer for the whole state of Christ's Church and the World. Peace. Words of encouragement for each other. Prayer for each other. Do not forsake the gathering together of yourselves for spiritual stimulation and mutual sharing of the Gospel. How quickly we forget without the reminders. Gathering around the Lord's table, partaking of bread and wine. 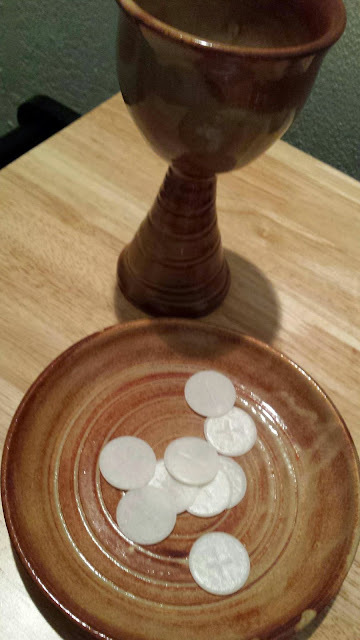 The body and blood of Christ. A sign that we are part of His body. We have fellowship with each other. After more hymns we part. But we part talking about the Lord. We talk about the sermon. We talk about our spiritual walk. We talk about reaching the lost. We talk about sharing the Gospel. We remember the commandments. We obey the words of Christ. We teach others. We connect with people we don't know. We share not worldly things but things of old. Holy things. Spiritual matters. Our walks are the most important. The path is narrow, and we want to guide others to it. We have found bread and we want to let others know where it can be found. Jesus Christ. Thank you for visiting this site. Listen to a sermon. Hear a hymn or psalm. Come to our space for a truly unique experience in this day and age.